The Ainu are an ethnic minority in Japan, living primarily on the northernmost Japanese island of Hokkaidō. This is a collection of tales from their culture. Stories include, The Loves of the Thunder-Gods, Why Dogs cannot speak, The Owl and the Tortoise, The Man who Married the Bear-Goddess, The Man who was changed into a Fox, and The Rat Boy. TWELVE hundred years ago a Chinese historian stated that "On the eastern frontier of the land of Japan there is a barrier of great mountains, beyond which is the land of the Hairy Men." These were the Aino, so named from the word in their own language signifying "man." Over most of the country of these rude and helpless indigenes the Japanese have long since spread, only a dwindling remnant of them still inhabiting the island of Yezo. Since the early days when a couple of them were sent as curiosities to the Emperor of China their uncouth looks and habits have made them objects of interest to more civilised nations. Many European writers have described them, but hardly any with such opportunities as Mr. 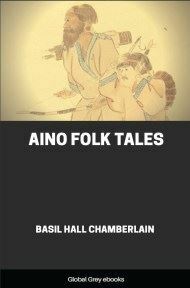 Basil Hall Chamberlain, Professor of Philology at the Tōkyō University, who has taken down from the Ainos the present collection of their tales, and prefaced it with an account of their ways and state of mind. It would hardly be for me to offer information on a subject so excellently handled, but the request of the Editor of the Folk-Lore Journal that I would write an Introduction enables me to draw attention to the views put forward by Professor Chamberlain in another publication , which, being printed in Japan, may be overlooked by many English folk-lore students, even of those interested in the curious Aino problem. As is well known, the hairiness of the Ainos marks them sharply off from the smooth-faced Japanese. No one can look at photographs of Ainos without admitting that the often-repeated comparison of them to bearded Russian peasants is much to the purpose. The likeness is much strengthened by the bold quasi-European features of the Ainos contrasting extremely with the Japanese type of face. Of course all this has suggested a theory of the Ainos belonging to the Aryan race; and, although the idea comes to nothing when examined strictly, its existence is an acknowledgement of the special Aino race-type. Mention must also be made of an anatomical peculiarity of the Aino skeleton, consisting of a remarkable flattening of the arm- and leg-bones. On the whole it is evident that the Ainos are an ancient race in this part of Asia, and so far isolated that anthropology has not yet the means of settling their physical connection with other Asiatic tribes. Professor Chamberlain's careful examination of the Aino language leads him to a similar result. It is made not only from his own knowledge, but with the advantage of working with the Rev. John Batchelor, who has lived as a missionary among the Ainos for years, and written the Grammar printed as a part of these Aino Studies. 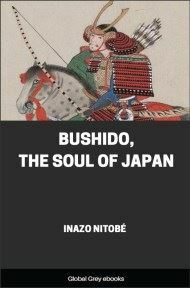 In structure the resemblances which the Aino presents to Japanese are outweighed by the differences; and, though it may ultimately prove to fall into a north-east Asiatic group of languages, this is so far from being made out that it is safest for the present to treat both race and language as isolated. Inasmuch as the little civilisation now possessed by the Ainos has in great measure been learnt from the Japanese, it is natural that their modern language should have picked up numbers of Japanese words, from the name of kamui which they give to their gods, down to the rice-beer or sake in which they seek continual drunkenness, now their main source of enjoyment. One purpose which their language serves is to prove how widely they once spread over the country now Japan, where place-names alone remain to indicate a former Aino population. Some of these are unmistakeably Aino, as Yamashiro, which must have meant "land of chestnut trees," and Shikyu, "place of rushes." Others, if interpreted as Japanese, have a far-fetched sense, as, for instance, the villages of Mennai and Tonami, which, if treated as Japanese, would signify "inside permission" and "hares in a row"; whereas, if taken to be originally Aino they may bear the reasonable sense of "bad stream" and "stream from the lake." The inference from records and local names, worked out with great care by professor Chamberlain, is "that the Ainos were truly the predecessors of the Japanese all over the Archipelago. The dawn of history shows them to us living far to the south and went of their present haunts; and ever since then, century by century, we see them retreating eastwards and northwards, as steadily as the American Indian has retreated westwards under the pressure of the colonists from Europe." As with their language, so with their folk-lore, which largely shows itself adopted from the Japanese. In the present collection the stories of the Salmon-king (xxxiv. ), the Island of Women (xxxiii. ), and others, are based on episodes of Japanese tales, sometimes belonging to world-wide cycles of myth, as in the theme of the mortal who eats the deadly food of Hades (xxxv. ), which has its typical example in the story of Persephone. On reading the short but curious tale (xvi. ), How it was settled who should rule the World, one sees at once that the cunning Fox-god has come in from the well-known fox mythology of Japan; and as to the very clever mythic episode of looking for the sunrise in the west, I find, on inquiry of a Japanese gentleman living in Oxford, Mr. Tsneta Mori, that this belongs to the tale of the Wager of the Phœnix, known to all Japanese children, and in which the Phœnix is plainly derived from China. On the other hand, there is much genuine Aino matter in the present collection.